This great property is approximately 20 acres located south east of Rib Lake on a quiet dead-end road. 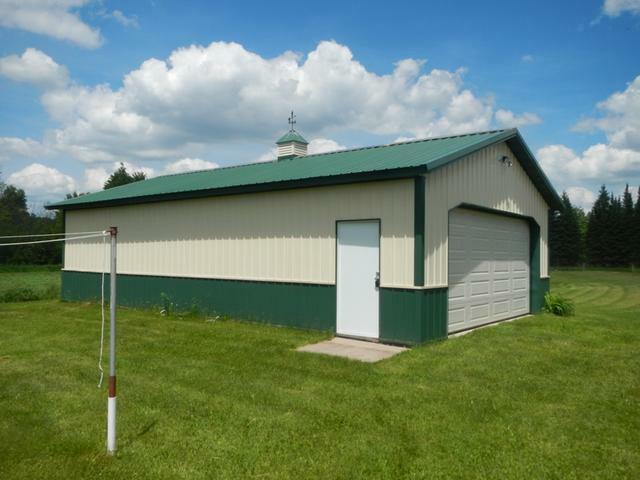 There is a 24x40 Meyer steel shed with a concrete floor and a newer Country Ridge Park Model Home with a large deck. The Park Model Home is 3 season and sleeps 8 and features insulated glass , electric fireplace, porcelain bathroom sink and toilet, full sized shower, and refrigerator. There is a drilled well and electric is on site. The acreage is about 60 % wooded with the remaining 40% being hay field. This would be a great hunting property or vacation property with the Rib River close by for great trout fishing. If you have been searching for a great building site for a new home this would be an ideal property since the lawn, driveway, power and well are already in!